When it comes to weddings, the biggest dream in any little girls’ mind is definitely what her own wedding will look like. 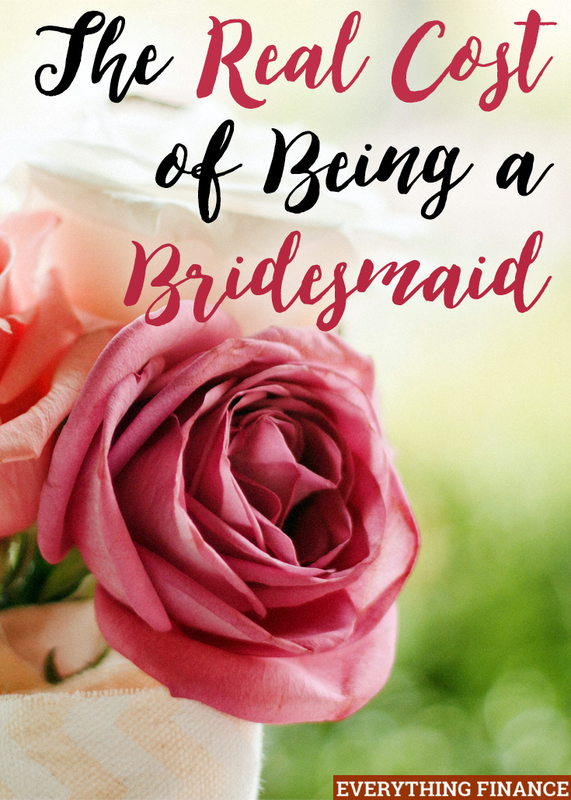 Then we get a little older and attend some weddings of our older family members, like cousins, aunts or uncles, or friends of the family, and we start to think about another side of weddings: how much FUN it would be to be a bridesmaid. At least, this is how it went for me. But once I got a little older, I realized that weddings weren’t just expensive when you’re the one getting married, they’re also expensive for those you choose to have in your wedding party. This is something most women forget to think about when they’re asked to be a bridesmaid. Being a bridesmaid at the wedding of a close friend or family member is definitely an honor, but if you aren’t careful, it can take a toll on your budget. Wondering how much being a bridesmaid can potentially cost? Here’s the real cost of being a bridesmaid so you know what to expect. Being a bridesmaid requires a lot of purchases related to your appearance on “the big day”. Most bridesmaids are responsible for purchasing their own dress, shoes, jewelry, hair, and makeup. Unfortunately, even though the bridesmaids usually have to foot the bill for these purchases, they typically don’t have a lot of say in how much money that will add up to. The bride generally has control over picking the dress, shoes, jewelry, and hairstyle for her bridesmaids, and just because you have your bottom line in mind doesn’t mean the bride does. Luckily, getting your hair and makeup done professionally is a common gift from the bride to her maids, which can help cut down on the cost of being in the wedding. Likewise, a recent trend in weddings is allowing the bridesmaids to pick their own style of dress as long as they are all the same color. This trend allows bridesmaids to show off their personal style, dress for their body type, and keep their budget in mind when they choose a dress style. Another large part of the cost of being a bridesmaid is travel. If the wedding you are in is local or nearby, this may not be a huge expense. For bridesmaids who live across the country from the wedding location, travel costs can be a big investment of time and money, not only in airfare, but also in hotel costs. Bridesmaids are also usually expected to attend events like bridal showers and bachelorette parties which will also require travel, and probably an overnight stay for those who don’t live locally. The travel cost of these two events could be lessened if they were to take place in the same city during the same weekend. One exception to bridesmaids having to pay for their own travel costs is when a bride chooses to have a destination wedding. Most of the time, the bride, or her parents, will pay for at least part of the travel costs for the wedding party to attend a destination wedding. However, a destination bachelorette party, like going to Vegas, is solely on the shoulders of the bridesmaids to pay for themselves to attend. With all these expenses, you’d think that you’d be off the hook when it comes to gifts, but showing up to the bridal shower, bachelorette party, and wedding without a gift would be tacky. Then again, this doesn’t mean you have to spend $50 or $100, or more, each time. One way to cut down on the cost of gift-giving is by getting together with the other bridesmaids and buying a group gift instead. This way, the bride gets something “big” off her gift registry and none of you had to shell out for the whole thing. Unfortunately, the costs of the bridal shower and bachelorette party don’t end there. At the bridal shower, the bridesmaids (who are usually the hostesses) are expected to plan the party, send the invitations, and pay for the location and decorations, and food and drinks for guests. There are ways to throw a bridal shower on a budget, so implementing them is key to keeping costs down. Likewise, bachelorette parties can be an expensive event. As mentioned, you have to pay for your own travel and lodging costs, and of course you have to pay for your own food, drinks, and activities. Bridesmaids are usually expected to split the cost of the bride’s travel and other expenses at the bachelorette party, too. Another cost that bridesmaids often forget to account for with these two events is the cost of new clothes to be worn at the bridal shower and bachelorette party. While bridesmaids don’t all necessarily need to buy a new outfit for these events, many do in order to feel dressed up or special. Many studies about the cost of being a bridesmaid forget about the time involved in such a commitment. This is a huge expense to overlook. Being a bridesmaid usually requires dedicating at least 3 weekends on separate occasions to events related to “the big day” – the bridal shower, the bachelorette party, and the rehearsal dinner and wedding and reception itself. This doesn’t even include trips to go wedding dress shopping with the bride, shopping for bridesmaids dresses, time spent buying gifts for the various parties and events, or time the bride may ask you to put toward helping with DIY elements of her wedding. Depending on your life situation, this big of a time commitment may or may not be a big deal to you. Being a bridesmaid and attending these weekend events may mean taking off from work early or even using vacation time if you have to travel a long distance. Being a bridesmaid for the wedding of a close friend or family member is a real honor and an experience that you’ll remember sharing with the bride forever. But you don’t want to spend forever paying off the real cost of being a bridesmaid, especially if you end up dealing with a real bridezilla! Next time you are asked to be a bridesmaid in the wedding of a friend or family member, take a minute to think about whether you are really ready for such a big time and money commitment. Have you ever been a bridesmaid? How much did you spend? Did you find it possible to save money on the expenses, or did you just save up for it? Should You Elope to Save Money?